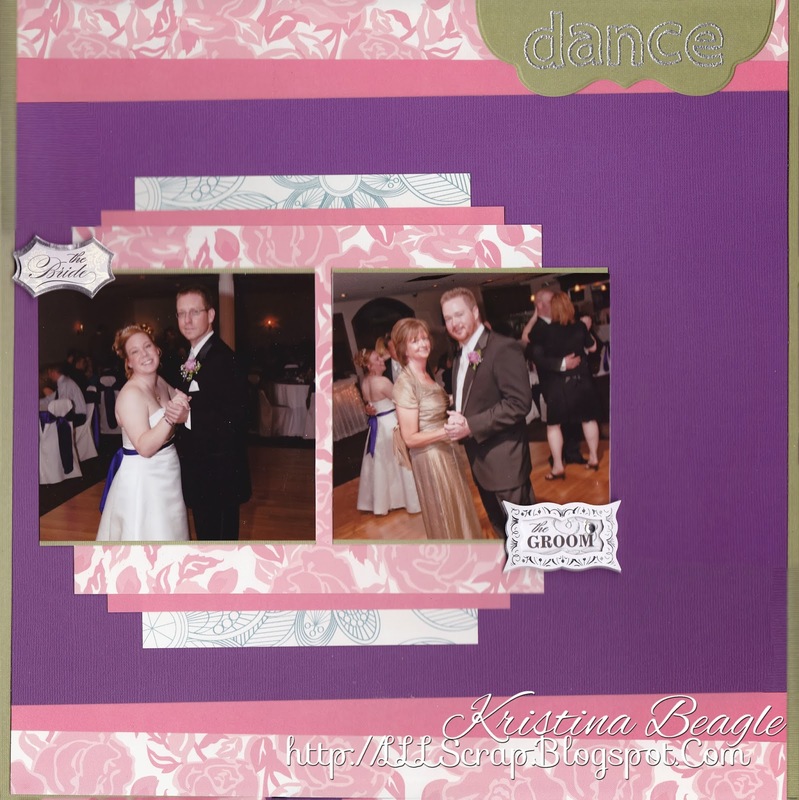 Today, A simple scrapbook page for my friends wedding album. Featuring the parents dance. 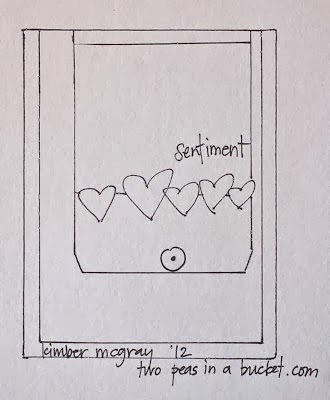 I used a sketch from Lets Capture our Memories. Dusted off my Quinns ABCs, I've been neglecting my alphabet stamps, and titles in general. I rarely give titles to my pages, don't know why... You'll also notice I nearly never journal, all thought I assume that may be more prevalent when I actually scrapbook my own memories LOL. I used half a spellbinders tag for my title, added a few misc. embellishments, and put it all together! 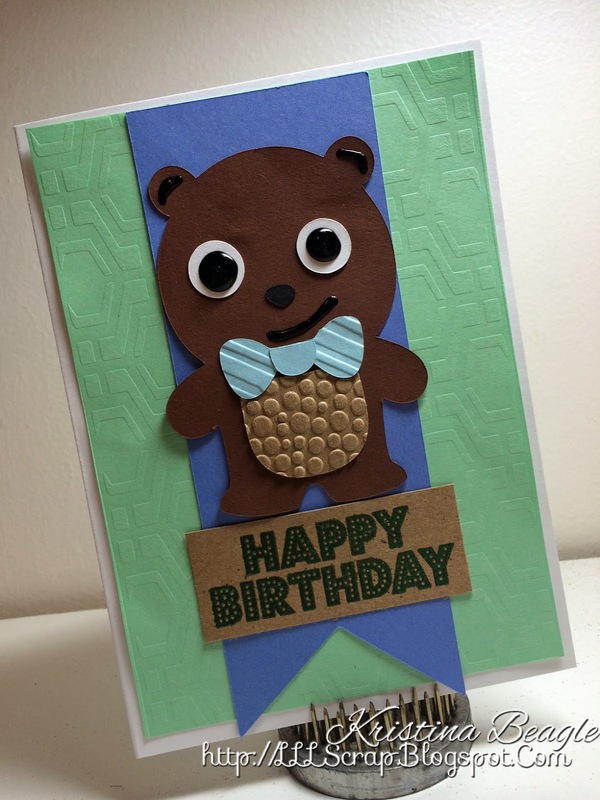 Silhouette Sunday: A Very Bearry Birthday! The weekends simply go by too fast! At least there was no snow to speak of.. Just a bunch of ice! Today I made a card almost entirely with my silhouette, beginning with a fun little technique I decided to try. 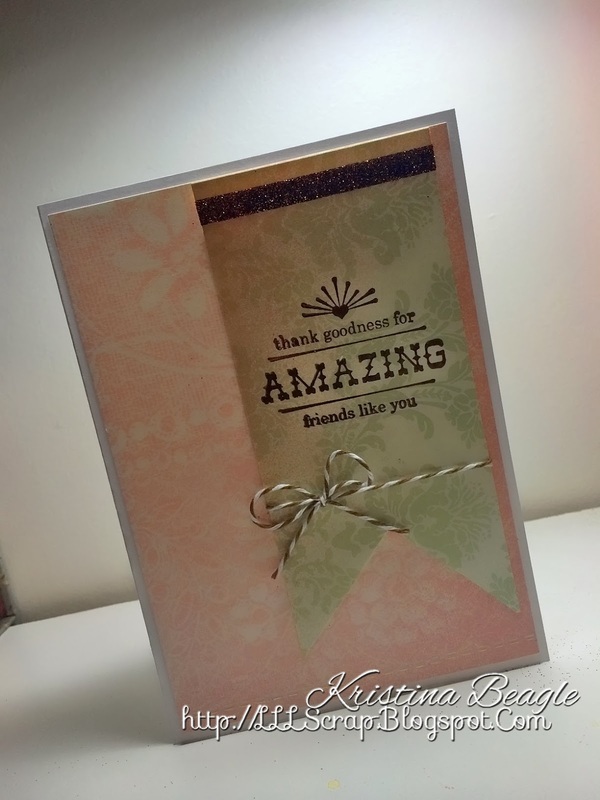 The embossed background is from a home made embossing plate I created on Silhouette with Acetate/Transparency Paper and a Background Image. Cutting it at a chipboard setting worked best. Might have to run it through twice. I embossed by running the cut out through my big shot with all tabs & 3 sheets of cardstock shims. Its only a very light embossing, but I almost prefer it that way. The cut-out will be very versatile as a stencil also. 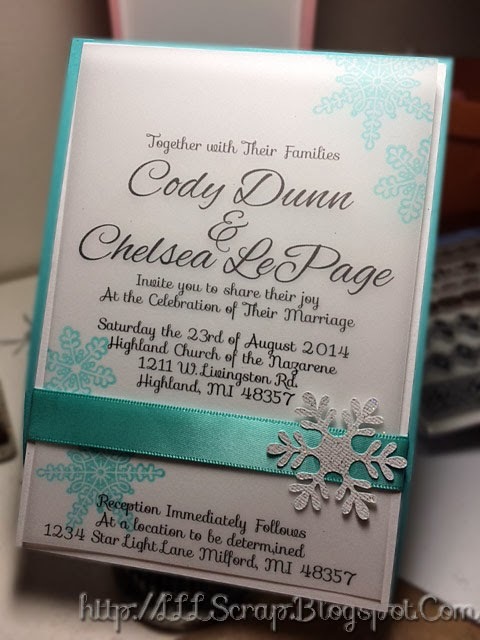 The bear and banner were also cut from Silhouette and a few run through the big shot for some embossing accents. The sentiment is Hero Arts, heat embossed. I wanted to make an almost exclusively Cricut card today. I have been neglecting my poor cricut, so for this card I created and designed the entire thing in the Cricut Craft room which made for a very quick and simply card. Craft Room is very useful, even for just making sketches! I used a 5x7 rectangle just to represent my card base (in hindsight I think I should've gone smaller), and once I had everything sketched out and sized, I separated all my cuts and loaded up my paper. 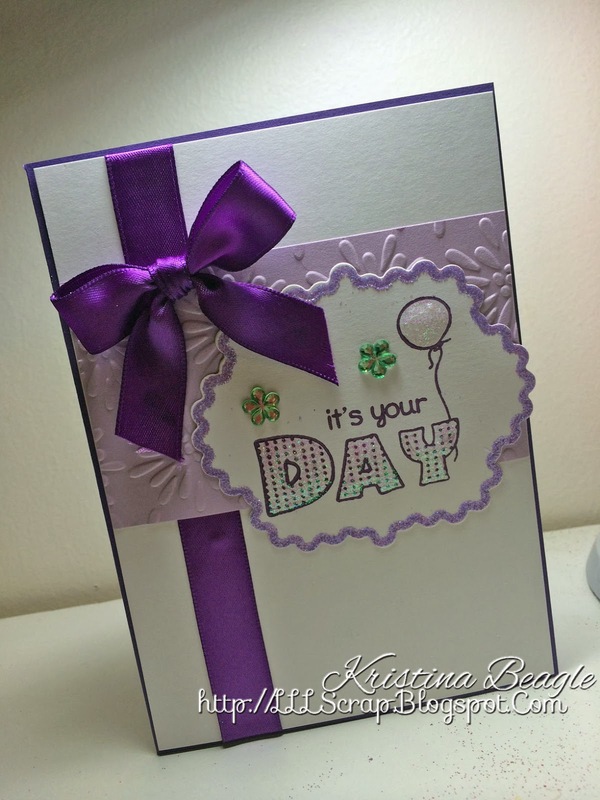 While Cricut was doing its thing, I embossed my card base and set up my stamps. Super Simple, less than 15 minutes! Now I just have to decide if I'm going to invest in the new Cricut Explore or not! The weekend is already over :( Weekends should be 3 days. Anywho... Here's a little birthday card I made with some Hero Arts & Cricut magic. I used paint daubers for the ink instead of traditional ink pads which gave it a really nice texture. 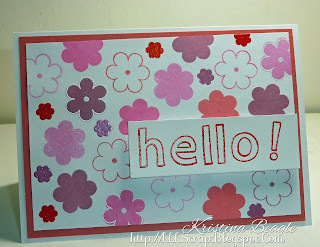 Incorporating stamping into scrapbooking can definitely be a challenge sometimes! So today I added just a few subtle images to enhance the page's elements. 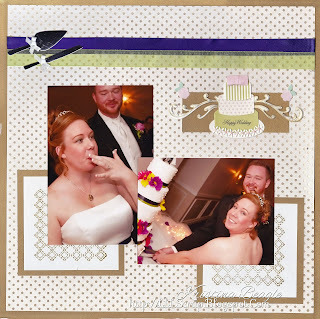 The photo mat is a background stamp embossed with some gold embossing powder for texture, and the Jolees Cake was a little too plan so I mounted it on some matching gold card stock & found these fun little flourish stamps that I had a matching die for! I've been wanting to bust out the distress inks so I came up with this colorful background idea. 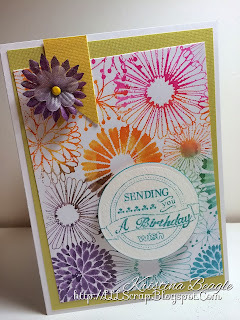 After inking my background stamp in sections, I gave it a few spritzes with a mini mister before stamping for a fun water color mix effect. Hello! A Card Drive for Emma! I just got done reading about a card drive for a little 7 year old who has been diagnosed with Acute Lymphoblastic Lymphoma. I can't imagine going through such a thing as an adult, let alone as a 7 year year old. deadline. 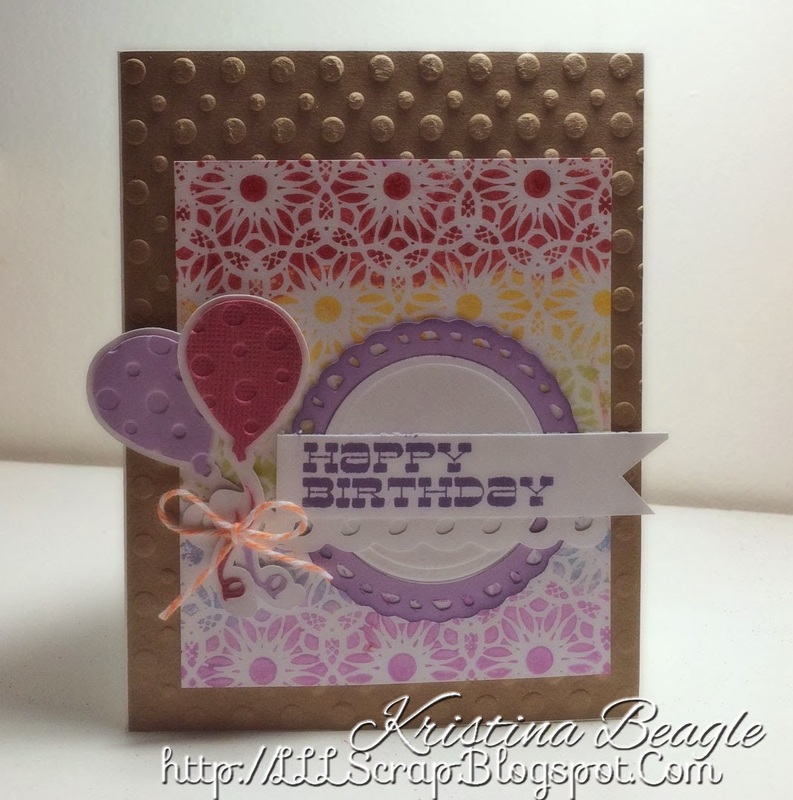 I wanted something bright and cheery for her.I stamped the background in assorted reds/pinks and added a little embossing here and there. I was originally going to keep it a one layer, but ended up deciding to pop out my Hello for a little dimension. 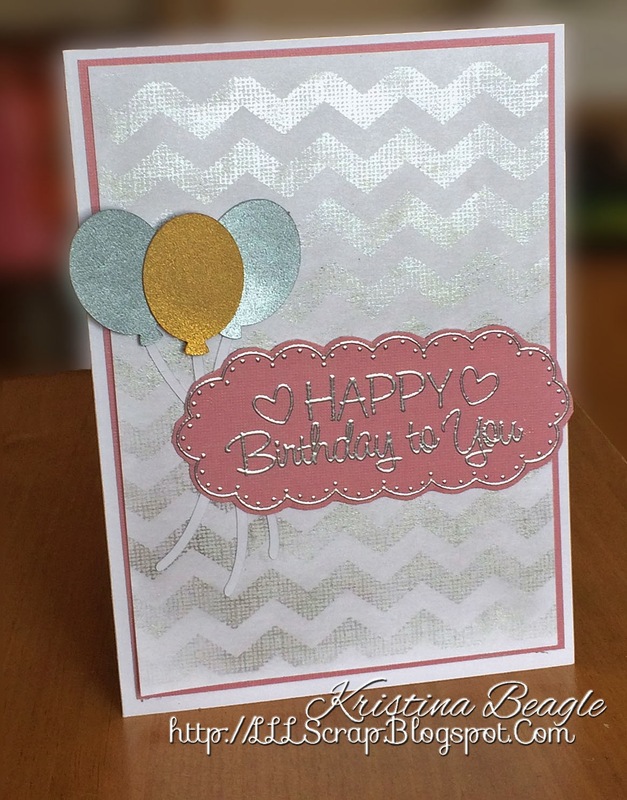 I love grey/silver and pink combinations. I'm thinking about that as a palette for the bathroom renovation I might someday complete. 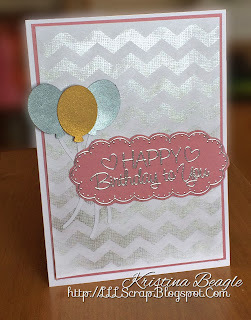 The main inspiration for this card is the Hero Arts Birthday (metallics) Challenge over at the Hero Arts blog. I stamped their Chevron backgound stamp in some versamark and brushed on silver PearlEx, I just wish it photographed better. So much more shine in real life! The sentiment, also hero arts, was stamped in versamark and then heat embossed. Finally, a lovely bunch of ballons. 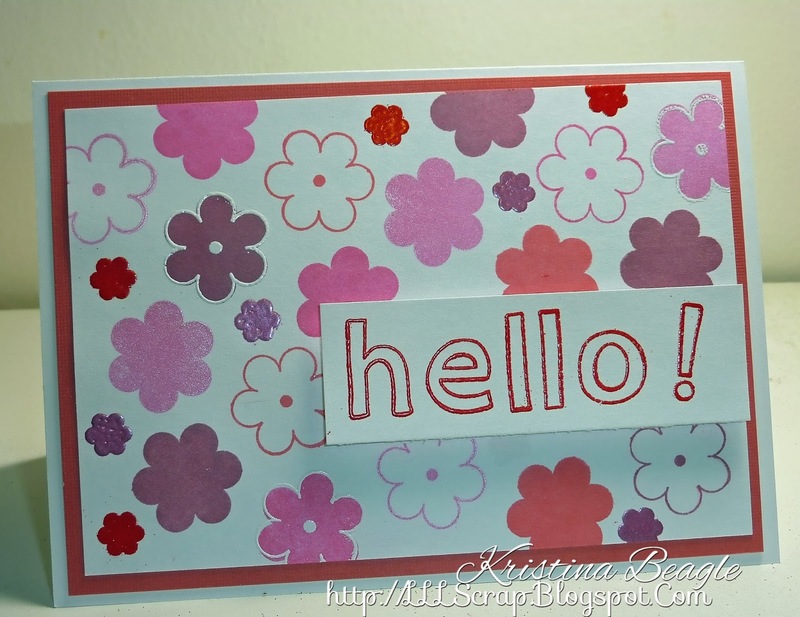 This is an SVG Cut file from Miss Kate Cuttables. And... I've just inspired my next manicure! Stay Tuned for my new Manicure Monday's starting tomorrow!! This was the card from hell! You wouldn't guess by how simple and basic it was, until I tried stamping the sentiment. I could not for the life of me, get this stamp straight. After about 10 tests/methods I remembered I had a stampamajig which solved everything. Anywho... 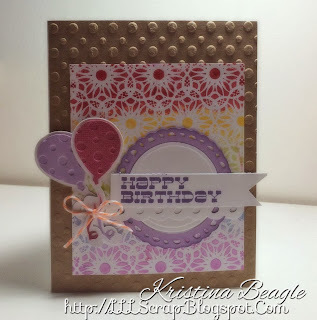 I used the sketch from this months Stack-A-Holic over at the DCWV Blog. Some simple twine & glitter accents and a sentiment from Unity. It's not my birthday, but I've made this card to give to myself! We've gone 2 consecutive days without a major snow storm! 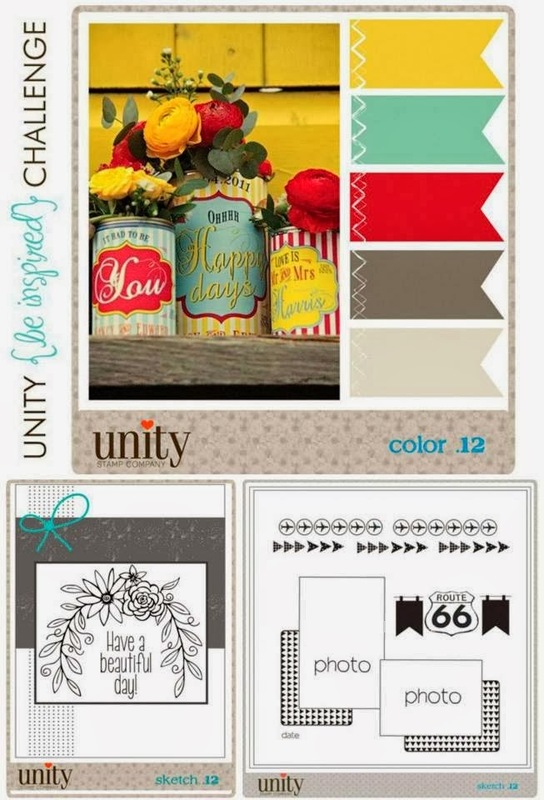 I really love the Unity Ornate Artisan Stackers stamp set w/ matching die because I can stamp & cut out. 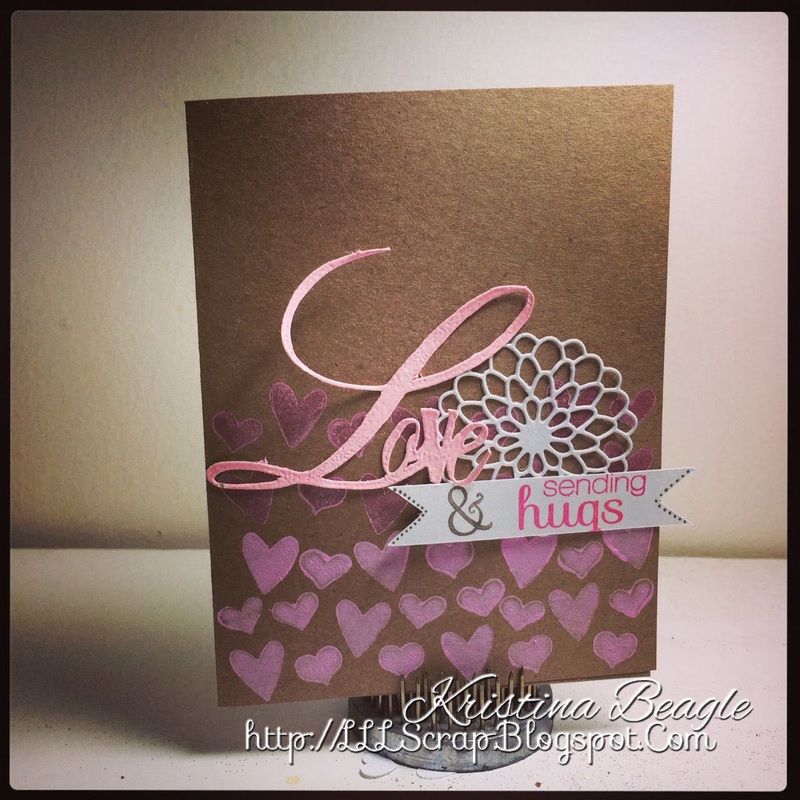 In this case, I stamped and embossed some heat and bond to apply glitter! That simply wasn't enough glitter so I filled the stamp in with some Stickles and I still felt the need... The need for Bling (ha-ha) so I added some Rhinestones. Happy Friday everyone & Have a great Weekend! Not much happy about it here with the amount of snow we've been having!! 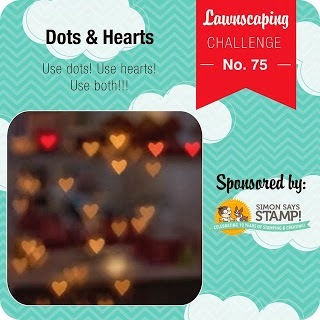 Here is my inspiration for this Card. Well, I haven't even finished the last wedding and its back at it! 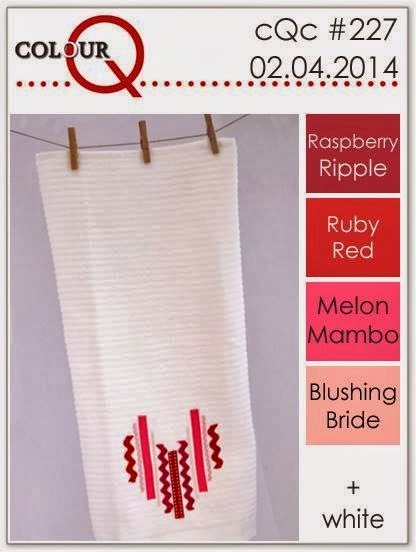 These aren't the finals (hence the winter wedding in august), just working up some designs for the bride. I stamped the back of some vellum with some Hawaiian Shores dye ink by Papertrey & some Martha Stewart snow flake stamps. Printed the verbiage on the front side of the vellum & attached to plain white card stock with some teal ribbon tied around. Topped it off with a snowflake I just bought from the Silhouette America store, cut out in some glitter white card stock. Mounted it on matching teal card stock & done.